Did someone say "ROCKY ROAD?" Wow! 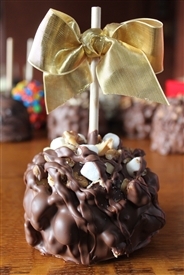 This Granny Smith is caramel dipped, chocolate covered and rolled in nuts (you get to pick from almonds, peanuts or the traditional walnuts) and mini marshmallows! Then re-dipped in chocolate all over again! It is available in milk, dark and white chocolate! At Uncle Sam's we offer REAL choices because we make our products fresh and to order!